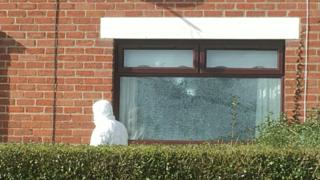 A number of shots have been fired at a house in Coalisland, County Tyrone. Nobody was injured in the attack at Loughview Gardens at about 00:20 GMT on Sunday. However, it is thought a number of people, including children, were in the kitchen at the back of the property. The shots damaged the front door, windows and a television at the house. Police said they were treating the "appalling attack" as attempted murder. PSNI Det Insp Trevor Stevenson said police were working to establish a motive. "Everyone has a right to live in a safe and stable community and this type of senseless and reckless criminality will not be tolerated," he said. "Thankfully, we are not dealing with any serious injuries, or worse today. "I want to reassure the community we are taking what happened this morning very seriously." The police have appealed for information.